"Are we going to be a country where a teacher dies because she cannot afford her flu medication or are we going to guarantee universal health care for everybody — rich, poor, young, old, pre-existing condition or not?" Oliver asked. It was the kind of high-profile bit of campaigning you'd expect for a congressional candidate running in a swing seat. But Oliver is trying to unseat three-term Republican U.S. Rep. Roger Williams of Austin, who has won his last three elections by 21, 24 and 21 points. But the story in 2018 has been counterintuitive. Oliver, for instance, is running an unabashedly progressive campaign in a historically Republican-leaning district, and still managing to raise a stunning amount of money — just short of $600,000 since announcing her candidacy last year. Between 2012 and 2016, Democratic nominees in the district raised a combined $98,500. It's a similar story for the Democrats challenging Republican U.S. Reps. Michael McCaul of Tomball, Pete Olson of Sugar Land and Brian Babin of Woodville. Though Donald Trump handily won all three districts in 2016, the Democrats there are running on platforms that include supporting universal health care, increasing the minimum wage, strengthening gun restrictions and refusing to accept donations from corporate PACs. And yet they're all raising more money than a Democrat has in any of those districts in nearly a decade. Some of the candidates argue those two factors — their progressive platforms and their strong fundraising — are no coincidence. Oliver says campaigns like hers are gaining more traction than previous efforts in the district in part because they are not coming off as politicians saying whatever they think will draw the most voters. Mike Siegel is running against McCaul, a powerful House chairman in a district Trump won by nine points. That in and of itself was a significant underperformance from 2012, when Republican nominee Mitt Romney won the district by 20 points and 2008, when Republican John McCain won it by 14. Yet despite the political headwinds against him, Siegel has raised $440,000 this election cycle, nearly five times more than the district’s Democratic nominees have raised in the last four election cycles combined, with a campaign that has appeared more focused on turning out the Democratic base than necessarily winning over undecideds. The most recent reports by the campaigns — which cover the first 17 days of October — show Siegel outraising McCaul for the first time this cycle. “I want to run as an authentic candidate. I want to run as who I am and how I will govern,” Siegel told the Texas Tribune. Meanwhile, in a ruby red congressional district that Trump won by 47 points, Democratic candidate Dayna Steele outraised GOP incumbent Brian Babin by over $100,000 in the third quarter. Overall, Steele has raised $846,000 this cycle, while campaigning on "Medicare for All", a $15 minimum wage and tuition-free community college. Steele’s fundraising success while running in such a district has even surprised her. Could Tom Delay's old district flip? In their effort to take control of the U.S. House, national Democrats have largely honed in on unseating three Texas Republicans: John Culberson of Houston, Pete Sessions of Dallas and Will Hurd of Helotes. These other House districts where Democrats are still pulling together well-funded campaigns have largely been viewed as long shots. For most of this year, that was the prevailing perception of Olson's district in the Houston suburbs, a seat previously held by former House Republican Majority Leader Tom Delay. Trump won there by 8 points in 2016. Republican Gov. Greg Abbott defeated Democrat Wendy Davis there by 29 points two years before that. Yet Sri Kulkarni, a former U.S. foreign service officer, has steadily gained momentum, particularly after his $577,000 third quarter fundraising haul — about $258,000 more than Olson raised over the same period. Since last year, Kulkarni's campaign has raised nearly $1.2 million. All the Democrats before him running for the seat going back to 2010 reported raising a combined $126,000. Last week, the influential Cook Political Report shifted its rating of TX-22 in Kulkarni's favor, from "Likely Republican" to "Lean Republican." The Democratic Congressional Campaign Committee also added TX-22 to its "Red-to-Blue" program, the top list for Democratic Party targets. On his campaign website, Kulkarni touts his support for a universal health care system "such as Medicare for all," increasing the minimum wage, banning high capacity semi-automatic weapons and requiring gun owners to carry firearm insurance — all progressive issues. Kulkarni has also received endorsements from national liberal heavyweights like Democratic U.S. Sens. Cory Booker of New Jersey, Kirsten Gillibrand of New York and Kamala Harris of California. "I want to help write the next chapter of our American story, where people never go bankrupt because they get sick, where every family is treated with compassion and decency," Kulkarni said in a recent campaign video. The Kulkarni campaign recently launched a TV ad buy, an impressive achievement for a campaign in an expensive media market that months ago wasn't expected to be in close contention. But the Olson campaign isn't convinced that the money is a sign of a district responsive to Kulkarni's message. "Donors in hard-left blue states like California, Massachusetts, and New York made a decision that the only way to force their radical agenda on America was to shower extremist candidates like Sri Kulkarni with out-of-state money," said Craig Llewellyn, Olson's campaign manager, in a statement to the Tribune. In response, Kulkarni emphasized that his campaign's fundraising was coming from individuals, not corporations. But to win, the Kulkarni campaign has focused on tapping into the district's rapidly changing demographics, reaching out to voters in 13 languages and making use of the fact that their candidate speaks six languages himself. Of course, enthusiasm for Democratic candidates in Texas this year is in large part trickling down from the top of the ticket where U.S. Senate nominee Beto O’Rourke, an El Paso congressman, is running a progressive campaign against Republican incumbent Ted Cruz that has drawn national attention. O’Rourke raised a record-breaking $38 million in the third quarter and $70.2 million overall. 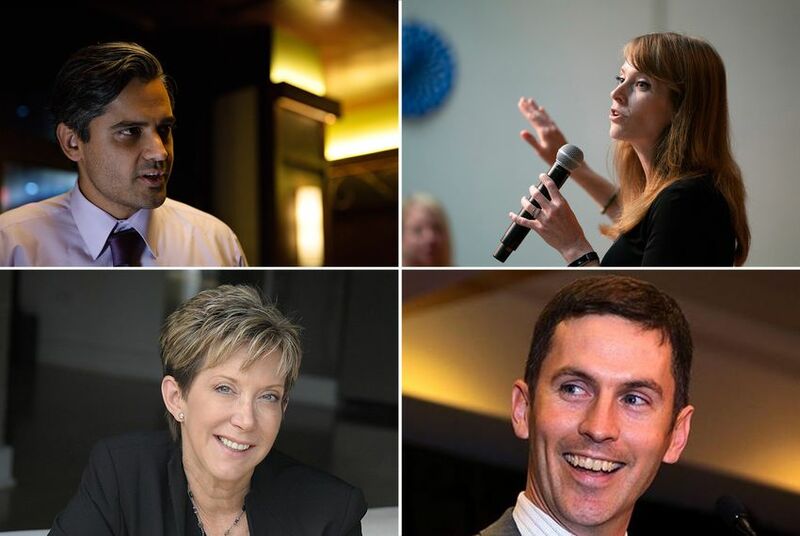 Some of these candidates are trying to seize on the enthusiasm surrounding O’Rourke’s campaign. Kulkarni introduced O’Rourke at an event on the eve of the start of early voting. Oliver and Siegel have both appeared at multiple events with O’Rourke. Oliver was among a group of Democratic candidates that joined O'Rourke in June to visit the tent city set up by the federal government in Tornillo at the height of the Trump administration’s family separation policy. Yet high donations can be indicative of high enthusiasm coming from within the districts or outside of them. The latter doesn't necessarily mean an election is competitive. “There are lots of people in the country who really want to see some change … and they’re willing to put their money behind their feelings,” Lampson said. Cruz, like Olson's campaign, has accused his Democratic challenger of drawing a large amount of donations from out-of-state liberal enclaves. Federal law doesn't require candidates to disclose donors who give less than $200, making it impossible to know where all of the money funding any of the campaigns are coming from. In the U.S. Senate race, the unknown donors amount to millions of dollars in contributions to both candidates. But despite their unusually strong fundraising, most of these Democrats, with the notable exception of Kulkarni, were facing a substantial cash-on-hand disadvantage heading into the final week before Election Day, according to the most recent filings. Williams was sitting on $1 million in the bank compared to Oliver’s $209,000. Siegel has $116,000 to McCaul’s $249,000. Babin has just under $1 million in the bank to Steele's $150,000. It’s not the cash situation alone that makes these races an uphill climb, however. Another challenge is the gerrymandered districts. Williams' district, for instance, includes part of liberal Austin but then stretches more than 150 miles north through more conservative communities, reaching nearly to Fort Worth. “Most of the congressional races are too lopsided, I think, for them to overcome not the strength of the incumbents, but the strength of the drawing of the district,” Lampson said. But the candidates themselves don't see themselves as necessarily out of sync with the districts they are running in.